The only condition more prevalent in children than head lice is the common cold. Why is head lice infestation so common? About 1 in 5 primary school-aged children will contract head lice this year – only colds are more prevalent in children1. And like colds and flu, kids usually pick lice up at school. Lice don't fly through the air like a sneeze, but they move fast when children have close physical contact. It's easy to pick up head lice from close contact in the confines of school or day-care and bring them home to spread. All it takes is sharing a hat, a brush or a cuddle. Head lice hang on to the hair shaft and they can be really hard to get rid of. As soon as head lice are detected, effective treatment is needed. The head lice cycle must be broken, otherwise head lice can continue to re-infest. 1. Stephen Barker. (2011). Avoid a lousy start to the year - observe National Head Lice Awareness Day. Available: http://www.uq.edu.au/news/?article=22572. Head lice live on clean and dirty hair — not on carpet, in beds or on the dog. Getting a head lice infestation is not about having clean or dirty hair. Head lice don’t discriminate. They make themselves at home whenever the opportunity presents itself. And home to head lice is a nice warm scalp. They won’t survive more than 24 hours anywhere else in the home. So there’s no point in doing loads of laundry, having the carpets steam cleaned or exiling the family pet to the dog house. Because they don’t swim or fly, head lice like it best when head-to-head contact occurs between children in school or day-care. Then they come home to spread. All it takes is sharing a cap, a brush or a cuddle. Head lice can be so hard to treat properly because their eggs are secured to the hair with a glue-like substance. Simple shampooing can’t dislodge them. It takes a proven effective treatment and plenty of fine tooth combing. A heat rash can itch more than a head lice infestation. Head lice are tiny. Most are about the size of the tip of a sharp pencil. While they are almost impossible to see, they can be equally hard to feel. The reason is that head lice don't always cause an itchy scalp. An everyday heat rash can be much more itchy. More often, children will itch behind the ears or on the back of the neck. These are the dark, warm places where head lice prefer to lay their eggs. Sharing – not always a good idea. Head lice are spread through head-to-head contact or through shared objects – a hairbrush, a cuddle or a hat can be all it takes. It's not about having dirty hair either. Head lice also like clean hair. And because they grip onto the shaft of the hair, washing won't dislodge them. An effective solution is needed to treat both the head lice and their eggs. Head lice grip onto the shaft of hair with tiny crab-like claws. Female head lice live for about a month, and each adult can lay around 7 to 10 eggs per day, cementing them firmly to the base of the person's hair. The eggs, also called "nits", are tiny oval capsules that are grey to caramel in colour beofre they hatch. After they hatch the eggs become white and are easier to see. The eggs hatch around 7 days after being laid to release nymphs that take about a further 10 days before maturing to an adult capable of laying their own eggs. 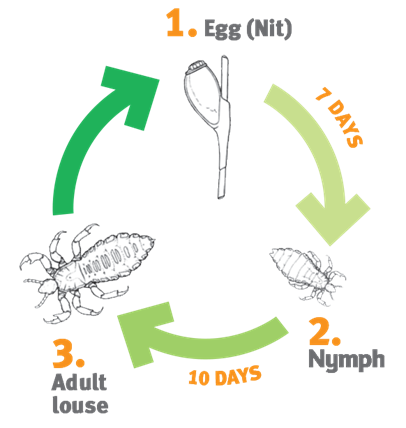 To effectively treat head lice NeutraLice recommends 3 treatments, 7 days between each treatment; so that head lice that hatch from any surviving eggs are killed before they can mature and lay more eggs.